Sign up for our farm fresh, local vegetable box. For our 2019 CSA box program, we've partnered with Farmigo to make sign-up and pick-up easier than ever. Once you have signed up, you can login to your Farmigo account here. 2019 CSA full share cost is $680 or 5 monthly installments of $136 if you choose our payment plan. Full share pick-up is every week for 20 farm boxes. 2019 CSA half share cost is $380 or 5 monthly installments of $76. The pick-ups for half shares will be every other week for a total of 10 farm boxes. All installments are done automatically every month for 5 months from the day of sign up (sign up plus 4 payments). The CSA season starts in May and runs thru October (20 week program). In order to provide the best quality, variety, and value to our CSA members, our farm-share program will include the best of Signal Mountain Farm's produce as well as selections from neighboring farms in our area. We will continue a centuries-old tradition of supporting the sustainability of other local, small farms by partnering and trading our best crops with one another. Though organic certifications are not held by every partner farm contributing to our CSA program, each of these partner farms are local, environmentally conscious, sustainable farms that are responsibly stewarding their crops and land. Quantities may vary depending on harvest cycles. Nevertheless, each box will contain the best of what's in season in our region from week to week. 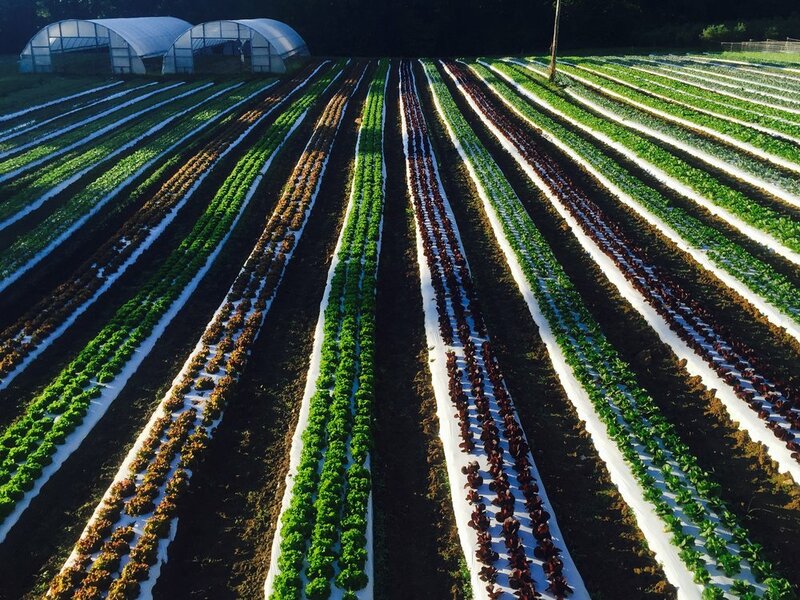 Signal Mountain Farm is a certified organic farm located just outside of Chattanooga. We grow over 60 varieties of the best organic fruits and vegetables you'll find—from specialty lettuces and sweet peppers to juicy blueberries and heirloom tomatoes. Thomas O’Neal, a Signal Mountain native, spent his summers living with his sister in Maui. He developed a passion for organic farming while helping out on fruit farms, growing bananas, avocados, coconuts, and papayas. In 1998, Thomas founded Signal Mountain Farm with a quarter acre garden and home deliveries to family and friends. His goal was to cultivate the highest quality, certified organic produce in Chattanooga. In his off seasons, Thomas continues to travel. Over the past 20 years, he has experimented with a variety of farming techniques all over Southeast Asia, India, Japan, China, Nepal, Bhutan, Sri Lanka, Morocco, Europe, Central and South America while growing fruits and vegetables exclusive to those regions. We grow and harvest organic produce three seasons each year. sugar peas, strawberries, beets, broccoli, cabbage, carrots, cauliflower, radicchio, collards, fennel, arugula, bok choi, kale, kohlrabi, lettuce, onions, parsnips, radish, turnips, swiss chard, greens, and more. beans, brussels sprouts, celery, corn, cucumbers, eggplant, summer spinach, sweet peppers, hot peppers, potatoes, summer squash, winter squash, tomatoes, blueberries, watermelons and more. beans, squash, cucumbers, eggplant, sweet and hot peppers, tomatoes, lettuce, greens, radishes, turnips, arugula, bok choi, broccoli, peas, fennel, kohlrabi and more. Wholesale organic produce available for stores and venders. We currently provide produce to grocery stores throughout the Southeast. Our on-site packaging facility allows us to harvest, wash, pack, and deliver produce all in the same day, ensuring that you receive the freshest possible product. Whether you are a local restaurant or a national distribution center, we can provide you with fresh, organic produce at a reasonable cost. If you're interested in our wholesale organic produce, contact us. Sign up for the 2019 CSA Box today! Get fresh, delicious, fruits and vegetables three seasons every year. We've partnered with Farmigo to make CSA sign-up and pick-up easier than ever. Enjoy fresh, locally-grown produce while helping sustain small farms and community agriculture.